How Much do UPVC Casement Windows Cost? How Much do UPVC Casement Windows Cost? UPVC casement windows have become popular throughout the UK because they offer unparalleled performance compared to windows based on aluminium or wood materials. For instance, UPVC windows are resistant to corrosion whilst the opposite is true for aluminium. Compared to wood, they are not affected by excess shrinking or expansion so they don’t swell up and jam or shrink and fit badly. With this in mind, read on to learn more about the features, benefits and costs of uPVC Casement Windows. For starters, the term UPVC stands for “unplasticised poly vinyl chloride”, which is a versatile polymer well suited for construction of window frames. Generally, polyvinyl chloride constitutes 80-85% of UPVC while the remaining 20-15% is made up of impact modifiers, processing aids, pigments, plasticizers, stabilizers, and fillers. The frames are cut to size from long multi-chambered profiles and then either joined together by internal metal corner joiners, welded or both. The idea behind the use of chambers (a kid of honeycomb effect) is fourfold. To make the profile lighter. To give it more structural integrity. UPVC itself is very “non-reactive”, which means it is resistant to fading from exposure to UV rays and things like “acid rain” – keeping the appearance better, longer. Typically, a casement window will open outwards. Side opening is the norm, but you will very often see a larger casement window set featuring a top opening smaller section. Bottom opening casement windows are called hoppers and top opening are called awning. 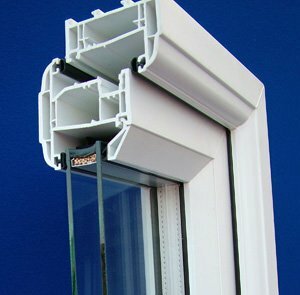 What are the main features of uPVC Casement Windows? Unplasticised polyvinyl chloride is a poor conductor of heat, meaning UPVC windows can prevent heat loss especially in winter. This in turn leads to lower home heating costs. It also works in reverse, reducing the amount of heat transfer from cold or hot outside weather conditions. According to the Energy Saving Trust, space and water heating accounts for more than 50% of the average UK household’s energy expenditure. Depending on the current type of windows that you already have, by replacing them with uPVC casement windows, you could lower heating costs substantially. U value of 1.6 W/(m²K) or better for the unit as a whole. Window energy rating (WER) of ‘C’ or better. Energy efficiency can be further increased by the use of metal oxide coated glass (low-emissivity), Argon, Krypton of Xenon gas filled double glazed units, and by increasing the size of the gap between the panes of glass in the unit. An average double glazed unit will comprise of 2 x 4mm glass panes separated by a 12m gap, giving an overall thickness of 20mm (12+4+4), often seen as 4-12-4. This can be increased to 20 mm, making the unit 28mm thick (4+20+4). A 16mm gap is seen as optimal giving a 24mm size unit (4+16+4). Triple glazing would further enhance the energy efficiency (and sound deadening properties), however, many see the additional cost as outweighing the benefits gained. 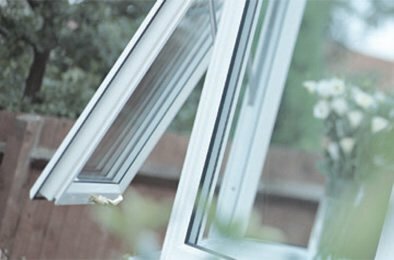 After installation, UPVC casement windows require minimal maintenance. For example, windows made from UPVC do not fade even after prolonged exposure to direct sunlight. This means you do not have to worry about the cost and hassle of painting your windows every few months. Besides this, UPVC material contains compounds that are specifically formulated to prevent ultraviolet (UV) light degradation. A typical maintenance program would only need to include inspection, cleaning and lubrication of the moving parts one or twice a year. Cleaning and visual upkeep is a simple matter of just washing them as required. You should also check the weather strips annually. These are the rubber strips that seal the glass to the window beads and any rubber seals that go around the casement. There are also small drains at the bottom of the window frame. Just make sure you keep these free of debris to stop them getting blocked over time by dust. UPVC casement windows come in different colours meaning you can easily find a window that suits your home’s indoor/outdoor decor. Some suppliers offer more colour options than others, but you can expect to have a choice of around 20 shades. Additionally, coloured frames can be manufactured to look like timber by giving it a surface graining. The effect is created during manufacture to be part of the profile and not a “stick-on” finish or a paint effect. The inside colour of the frames does not have to be the same colour as the outside, for example you could have Black/ brown outside and white inside. You can easily find a window appearance that suits your personal preferences thanks to the wide range of choices available in the market. 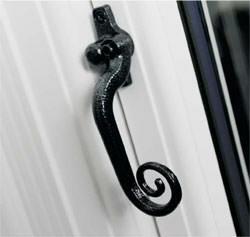 The type of window furniture, such as handles, can give character to, or take it away from, your windows. Why use plain white when you can go for chrome, brass or black, to name a few – or even fancy designs like the “Monkey Tail”(shown opposite). Modern upvc frames are not prone to distortion even after exposure to extreme temperature differences. In comparison, some aluminium windows can be prone to some distortion when exposed long term to high or low temperatures due to the underlying material’s high thermal expansion coefficient. Timber windows are renown for jamming after long wet periods because the wood swells if it absorbs some water. The opening and closing of the windows are controlled by a single handle making the window very easy to open & close fully or partially. Window handles feature individual key locks. The handles control a series of internal locks that engage on multiple points around the frame, making the unit very secure. The inner pane of the double glazing is quite often made from toughened glass, but you can opt for both panes to be tempered safety glass. 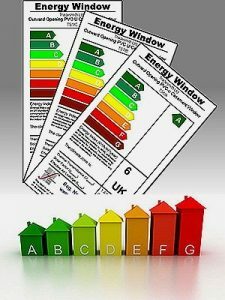 The cost of installing new or replacement UPVC casement windows varies depending on size, brand, energy rating/efficiency, and features. You would be looking at around 12 varying sized windows for an average sized 3-bedroom house. Many people change their front and back doors at the same time, so if that is the case, could add a further £500 to £800 per door for uPVC or £900 to £1,100 per door for composite versions.